Avenged Sevenfold News: Houston Press: "Watching Avenged Sevenfold in 2014 is a lot like watching Iron Maiden in 1984"
Houston Press: "Watching Avenged Sevenfold in 2014 is a lot like watching Iron Maiden in 1984"
By the time that headliners Avenged Sevenfold were ready to roll, a lot of the older and more inebriated audience members were beginning to rub their sore backs and necks. The younger fans were still full of life for the undisputed champions of mainstream throwback metal, a weird and popular subgenre all its own. A collective “yesssss” seemed to go up from the crowd as the band’s dramatic stage set was revealed, centering on the enthroned remains of a skeletal, long-dead king. But a genuine roar finally broke free when the columns of flame erupted. Watching Avenged Sevenfold in 2014 is a lot like watching Iron Maiden in 1984: amazing stage set, tight guitar harmonies, and soaring vocals added up to titanic singalongs that got mighty loud even up on the hill. 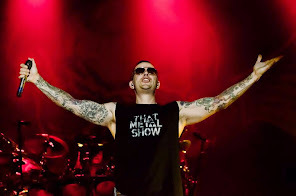 Though the day had been impossibly long and hot — or perhaps because it had been — A7X singer M. Shadows still hailed his people in the grass as the show drew to its fiery conclusion. As the band broke into “Bat Country,” smiling dudes from all over the hill streamed over to the wild pit that Shadows had pointed to, squeezing the last drops of Mayhem out of the weekend. One could hardly help but throw the horns in solidarity. Today, we’re all a little burned, a little bruised. But no one can claim we didn’t rock, man.